The Pentagon II packs a powerful AMD 3000+ processor, making it the perfect system for the home and office. Backed up with 1 GB of DDR ram and a huge 200 GB hard drive, the Pentagon II has enough space to store massive amounts of data. ITN�s commitment to our customers also ensures that the included 3 year warranty will keep your mind at peace. AMD Sempron� 64 processor 64 Bit technology allows you to do what you want on your computer. Whether it�s watching videos, ripping and playing music, or playing low 3D demanding games, with AMD64 performance, you can fully enjoy any multimedia experience with a �you are there� reality. Dual layer technology virtually doubles data storage capacity on DVD recordable discs from 4.7 Gbytes to 8.5 Gbytes while remaining compatible with existing DVD video player and DVD-ROM drives. The introduction of dual-layer DVD+R technology is regarded as the next important milestone in optical data storage options available to consumers. 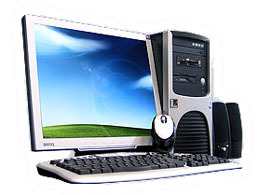 Athlon and Athlon XP are registered trademarks of American Micro Devices. Microsoft, Windows, Windows NT, Windows XP, and/or other Microsoft products referenced herein are either trademarks or registered trademarks of the Microsoft Corporation. Other product names used in this web site are for identification purposes only and may be trademarks of their respective companies. All prices inclusive of GST. As some products may not always be in stock, please contact us to re-order. Please call (08) 9434 6173 for latest product pricing and availability.